Tak, Couturier ma w sobie to wsysanie teatru Lupy, tę leniwość, zatrzymanie czasu, uświęcenie czasu, to snucie, kiedy wydaje się, że nie ma nic, a jest wszystko. I jeszcze więcej... Poza tym Couturier, jak Lupa, lubi Tarkowskiego. Ta płyta jest tego najlepszym dowodem. Jej tytuł główny, tytuły poszczególnych części (choćby Solaris I i II,­ Andrei, Ivan, Stalker), lead pod tytułem ("muzyka inspirowana filmami Andreja Tarkowskiego, grą jego ukochanych aktorów i sposobem operowania przez niego kolorem i dźwiękiem"). Jak to brzmi? Brzmi muzyką w muzyce. Prócz Bacha ("Pasja" pojawia się także w ostatnim fragmencie - L'éternel Retour), słyszymy jeszcze - dwukrotnie (Nostalghia, Andrei) - temat z trzeciej części "Sonaty na wiolonczelę i fortepian" Alfreda Schnittkego oraz fragmenty "Amen" ze "Stabat Mater" Pergolesiego (Toliu). Poszczególne części mają też swoje dedykacje: m.in. dla operatora Svena Nykvista (Crépusculaire), scenarzysty Tonino Guerry (Nostalghia), kompozytora Edwarda Artemiewa (Stalker), aktorów - Erlanda Josephsona (L'éternel Retour) i Anatolija Sołonitsyna (Toliu). 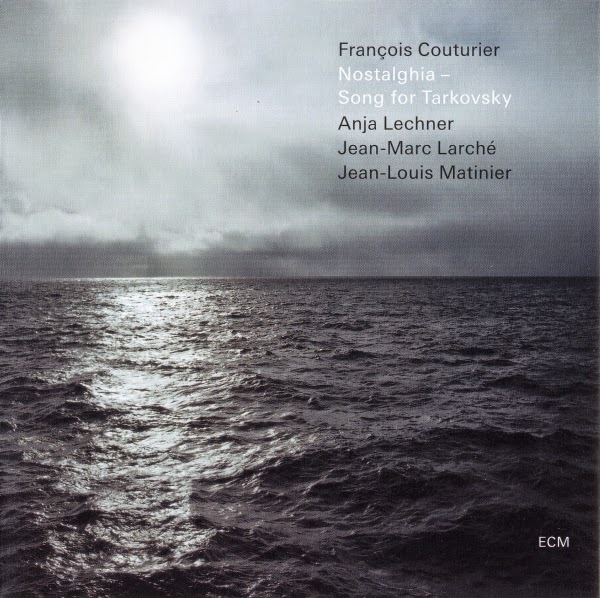 So espouses Erland Josephson as Domenico in Andrei Tarkovsky’s 1983 masterpiece Nostalghia, of which this album by pianist François Couturier takes the name. Domenico is, in many ways, himself a musical figure. As the very madman he admonishes, one who shackled his family in their own home for seven years as protection against an imperfect world, he is constantly refolding his own psyche in a leitmotif of fixation, building reality from blocks of fanciful impulses, each more poetic than the last. Yet as Tarkovsky himself once averred, art exists only because the world is imperfect. Music thrives on insanity. That said, the even keel of Nostalghia presents the listener with such an expressive compass that even the most elemental sound becomes a northward tug. 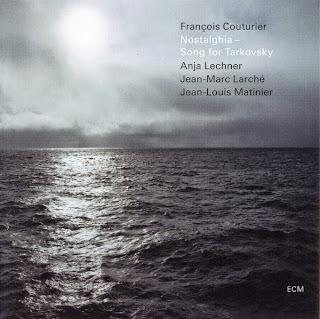 Anyone who has followed Couturier’s ECM travels will know that he is a musician of many directions. From the taut classical forays of Poros to the border-crossing trio recordings with Anouar Brahem (see Le pas du chat noir and Le voyage de sahar), he is anything but predictable. Counting cellist Anja Lechner, accordionist Jean-Louis Matinier, and saxophonist Jean-Marc Larché among the present company, he darkens Tarkovsky’s blueprints with the press of every key until they are ashen with wayfaring. The album’s outer circle is inscribed by way of “Erbarme Dich” from Bach’s St Matthew Passion, which seeds the opening and closing tracks by way of profound lament. In the absence of words, “Le Sacrifice” (Bach’s aria appears in the Tarkovsky film of the same name) holds on to the text of the moment. In the absence of the cross, one feels the intersection of piano and accordion as a sacrifice in and of itself. The feeling of decay is palpable—surely, if imperceptibly, approaching disappearance—as was Tarkovsky’s play of color and shadow. The concluding “L’éternel retour” unravels by way of piano alone. Like a lost entry from Vassilis Tsabropoulos’s The Promise), its hand closes the lid of a box that houses creative spirit. That the song bears dedication to Erland Josephson indicates Couturier’s attention to detail in paying tribute not only to the artist of interest, but also his brilliant actors and collaborators. “Crépusculaire,” for instance, honors Sven Nykvist, Ingmar Bergman’s right-hand cinematographer (who also filmed The Sacrifice) and moves accordingly by the touch of Lechner’s picturesque bowing. Her feel for notecraft and harmony is matched only by her attention to atmosphere. Couturier blends pigments with charcoal-stained fingers, each a pontiff reduced to a smudge across gray sky as the accordion finds its peace in the waters below. The combination aches with dew, trembling on grass stems when the three instruments at last share the same breath in focus. “Nostalghia” is for screenwriter Tonino Guerra, with whom Tarkovsky co-wrote the screenplay for that very film. It opens us to the affectations of the full quartet and takes its inspiration from Schnittke’s Sonata No. 1 for violoncello and piano. This gentle music is a wish turned into stone and laid in stagnant water. The most obvious dedication, “Andrei,” also incorporates the Schnittke. A steady pulse in the left hand frees the right to orbit the keyboard, while the accordion fits like wind to wing over barren plains of consciousness. “Stalker” gives proper attention to Eduard Artemyev, who wrote the soundtracks for that film and Solaris, and meshes bucolic and hypermodern impulses in kind. Its impactful pianism gives up many relics, each more sacred than the last. Anatoly Solonitsyn, lead actor of Andrei Rublev, is the final dedicatee. With its allusions to the “Amen” from Pergolesi’s Stabat Mater, “Toliu” multiplies shades of night. Although Couturier consciously avoided the evocation of specific Tarkovsky scenery (this is more than a concept album), the feeling of pathos is so visual that one might as well be watching a film by the great director. The pianism shines like the water so prevalent in Tarkovsky’s cinema, if not swimming among many artifacts strewn below the surface. And in any sense, Couturier is very much the director of all that one hears throughout the program, as borne out most directly in the freely improvised “Solaris I” and “Solaris II.” In these the soprano saxophone turns the sun into a pilot light, and the world its oven, even as the rest of the ensemble hangs icicles from the eaves. Still, the overall effect is more literary than filmic, picking up words and turning them into actions that grow with listening. “Ivan” references Ivan’s Childhood, Tarkovsky’s first feature. Its declamatory beginning spawns an almost theatrical feeling in distorted fairytale gestures before the quartet rejoins to finish off strong. In the wake of such confluence, Couturier’s solo “Miroir” wipes the slate clean, leaving superbly engineered ambience as the only evidence of an inner world to be discovered. Each step taken on this Escherian staircase walks a path of light.